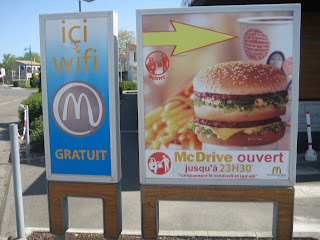 I’ve always disliked McDonald’s, mainly because of the disgusting food, but in Bordeaux I’ve had an epiphany. Bordeaux’s an old fashioned town. A Sunday afternoon is like being in an English suburb in the mid-70s – all bored teenagers and bus shelters and not an open bar to be had. Finding an internet connection is just as bad. The chateaux generally have wi-fi (pronounced to rhyme with ‘leafy’), but there’s something about the stone walls that blocks the signal. At Lafaurie Peyraguay, where we stayed this en primeur 2010, you had to sit in a broom cupboard in the entrance hall to get a signal, and even that was poor. Then you might find a café with wi-fi and discover they charge for it, and it still doesn’t work. And in any case, I hate giving my custom to some so mean-spirited and lacking in promotional nous that they charge for wi-fi. But McDonald’s is another story. Generally empty, friendly staff, fair coffee, accessible power sockets – and free connection. 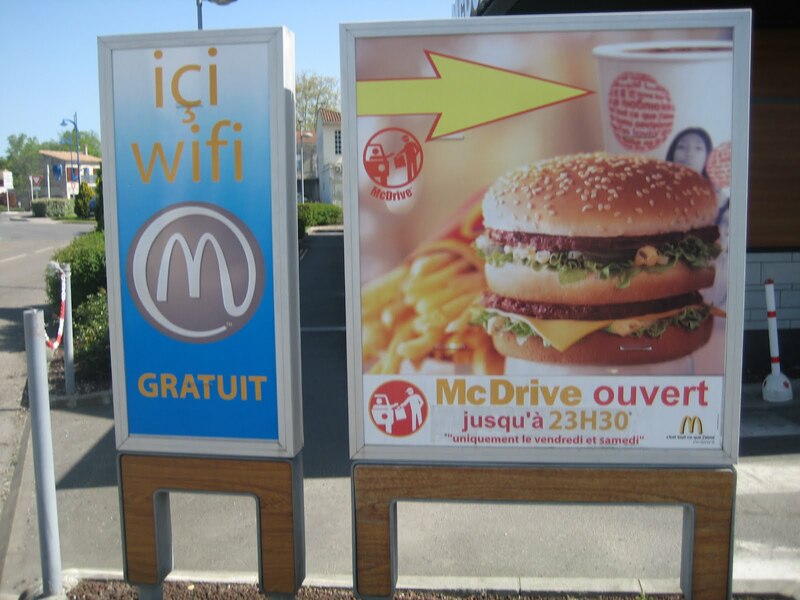 What’s more, everyone in Bordeaux knows every McDonald’s, as if it’s on a satnav in their inner ear. Liliane Barton of Leoville of that ilk didn’t bat an eyelid when I asked her if she knew a McDo’s (as they charmingly style it). ‘The nearest one is Lesparre,’ she said. Lesparre was 25km away. So the Decanter team, which starts twitching if it’s without internet connection for more than half a day, whiled away many a happy hour under the sign of the golden arches. The best McDonald’s, with the smiliest staff, is on the D2 at Le Pian Medoc. I didn’t have a Big Mac though. I wouldn’t go that far. Keep your speeches short. Martin Krajewski, the tow-headed proprietor of Chateau de Sours in Entre-deux-Mers, likes to entertain, and his parties are a respite from the formality of the Medoc. Anyway, we filed into the dining room – two long tables end to end – through the kitchen, which was rather nice. Krajewski stood up and clinked a glass. Don’t you get a sinking feeling when that happens? In the Medoc you know you’re in for the long haul. I needn’t have worried. Our host said, ‘Welcome everyone. We’ve got some superb wines tonight. Enjoy yourselves,’ and sat down to applause. The wines? A Figeac 2001, Mouton 66, Leoville-Las-Cases 82, Yquem 2002. The Figeac was superb, powerful and perfumed with a hint of brett that got everyone swapping bottles and glasses, sniffing and arguing. The LLC (I’m going there tomorrow) was even better, with a freshness and jauntiness and a length that went on and on, indeed never stopped, unlike the Mouton which was venerable but with a touch of dryness on the finish. Yquem was Yquem, as the aficionadoes say. The wine trade’s been remarkably silent on the subject of price this year. Since 1750 it’s been an article of faith that the British wine merchants will hyperventilate when they get on the subject of en primeur release prices. Stephen Browett at Farr Vintners usually leads the charge. He even threatened to boycott the campaign if the chateaux didn’t promise to reduce prices on the 2008 vintage. Adam Brett Smith at Corneys will put a note online – a very polite suggestion that they just won’t be able to sell the stuff if it’s too pricey. 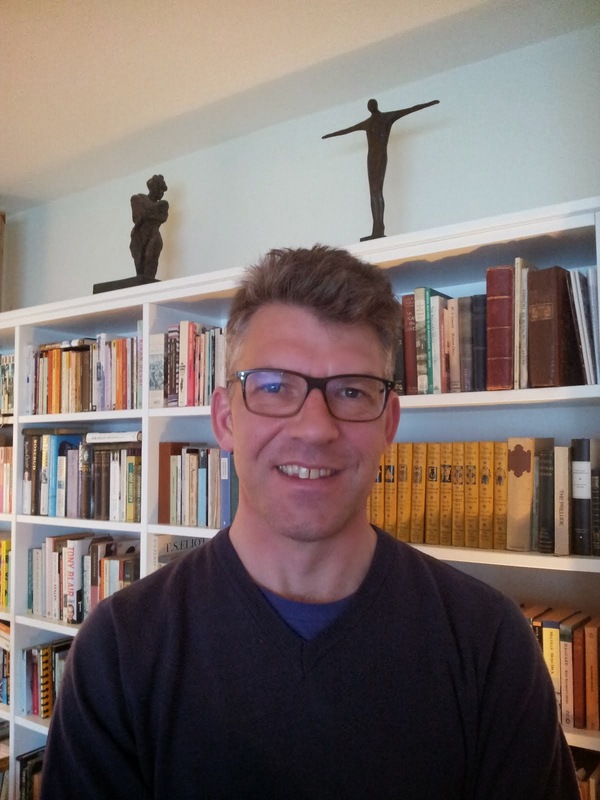 BBR’s Simon Staples lets his feelings be known. The smaller merchants squeak a bit (but not so much as to endanger their allocations). Then the negociants in Bordeaux pitch in. But this year, not a peep. It’s China which has done it. Until the bubble bursts, Bordeaux, at the top end, is simply not going to produce an off-vintage again. The first growths and their siblings – a dozen or so properties – will sell their wine whatever happens. The Chinese buy by brand, not by vintage. ‘There is a consensus in the wine trade that it is very unlikely that prices will come down on last year, and likely that they will stay the same,’ Jean-Guillaume Prats at Cos d’Estournel says. He also says that if there’s an increase, it will ‘probably be accepted’. Why aren’t the merchants howling? Because they’re making an awful lot of money. Farr sold £62m of Bordeaux last year, a third of it to the Far East. Berry’s sold £110m. They hardly had to pick up their blackberries to do it, and the 08s and a dozen other vintages are flying off the shelves on the back of the 09. Of course the merchants aren’t complaining about release prices – why worry, when you can flog it all to China at any price you care to mention. Jubilant is the word. If you’d been parachuted into the En Primeur opening party at Smith Haut Lafitte last night, you would have thought something had been slipped into the wine. The chateau owners have thrown off the faux-sheepish mood they’ve worn for the last couple of months and are now openly celebrating what they assure us is another superb vintage. There’s no such restraint now. In the cellars at the Smith party, the always affable Patrick Maroteaux of Branaire Ducru looked as if he’d just won the lottery (which in a sense he has). ‘Fabulous,’ he kept saying, and bent my ear for five minutes on the great growing season, its hot dry days and cool nights. The weather gods simply can’t stop smiling down on Bordeaux. They arranged a superb growing season, and now for En Primeur it’s gorgeous, 25 degrees yesterday, the same today, fragrant wisteria blooming on the warm honeyed stone of the chateau walls… under these conditions a glass of blush Zinfandel would taste like cru classe. Barton’s worried that many journalists don’t know how to taste young Bordeaux (there’s a rumour going round that James Molesworth, the new Wine Spectator Bordeaux critic, hasn’t quite got the barrel experience yet, but more of him, and his former colleague James Suckling, later). So Barton’s delighted that his wine is so pretty. I tasted it yesterday, and it is delicious – perfumed, with lovely acid and nice grippy tannins, fresh and very fine. 13% alcohol (Barton’s harvest was one of his earliest – he’s not one to let the grapes hang). But above all it’s approachable and comprehensible. The press is going to love this vintage, everybody hopes. We’ll see as the week goes on but the first signs are good. Back to Suckling, who would be twirling his moustache, if he had one, and chuckling evilly. He’s the villain of the piece - he broke the Union des Grands Crus embargo and published his notes early. Michel Bettane, France’s eminence grise and general grand fromage, threatened to boycott en primeur if the UGC didn’t put a stop to riffraff like Suckling refusing to play the game. Others weighed in. There were murmurs of ‘ce n’est pas le cricket’. He’s abused the trust of the chateaux, someone said. To say he’s opened up a can of worms is an understatement. There are over 30 comments on Decanter.com’s article, posted last week – and they’re not talking about the morality of breaking embargoes. No – the comments are all about the point of scoring wines in the first place, the validity of those scores on wines tasted so young, and how the perfidious wine trade stitches up the press. I don’t think it’s that naïve to think that the chateaux are quite within their rights to use critics’ scores as they see fit. It’s really no more immoral than a film distributor using favourable quotes on a poster, a good few weeks before the film is released. Presumably he castigates his Italian friends for saying Inghilterra instead of 'England'? How I would love to be at one of his soirees. But a question for you, 'Bill'. How do you pronounce niche? Aha! I thought so! it's a French word, my friend, so less of that post-colonial 'nitch' nonsense. Honestly. It's poor sport really. Like shooting fish in a barrel. Anyway - here it is - I'm only doing it so I get a link back, you understand. I won't mourn the passing of Oddbins, in much the same way I don't mourn the demise of my mother's cat, Dracula, a splendid black beast of of formidable killing power, who ended life incontinent and smelling of damp. His time had come, much like Oddbins'. The London Bridge branch definitely smelt mouldy a couple of weeks ago, as if there were a body under the floorboards. Possibly there will be, if the disgruntled employees of the once-much-loved chain get their hands on the management after Decanter.com's revelations of what certainly needs explanation even if it's not skulduggery: the payment by managing director Simon Baile to marketing director Martin West of just over £17,000 for 'redundancy'. This was on 8 March, after Oddbins had started talks with corporate advisers Spectrum to find a way to deal with debts of over £20m.They must have had an inkling they were headed down the tubes - everybody else did. If I had a quid for every time Oddbins was described as 'beleagured' or 'embattled' or, lately, 'stricken', I'd be a rich man. What were they doing paying out five-figure sums to directors when they hadn't paid their suppliers for months? Creditors coming out of the meeting last Thursday when HM Revenue and Customs delivered the coup de grace (they are owed £8m) found the whole thing fishy. 'There's a lot about it I don't understand - some things don't stack up', one highly-placed figure told me, hinting that there was an awful lot more to come out about the relationship between Ex-Cellar, the company set up by Baile and his partner Henry Young to buy Oddbins from Castel (who own the charmless Nicolas stores and who had done so much to ruin the chain). Creditors were also outspoken about Oddbins' failure to communicate with them... I found the same - when we asked the management to comment on this £17k payment to West, we were told we'd got our facts wrong. Then we produced a copy of the receipt, signed and dated, and we were told it was a ‘contractual compromise agreement’. No idea why it was called a redundancy payment on the receipt. Anyway, it's very sad for the 400-odd employees who have lost their jobs, but as for the passing of a shop that was once a byword for innovation, quirkiness and charm, and lately had become surly, secretive and boring (not to mention smelling of damp), I'm not shedding much of a tear.